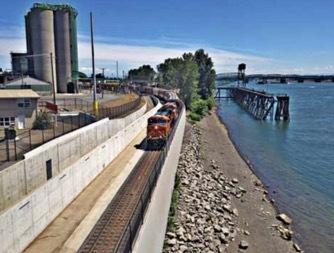 On 13 August, the Port of Vancouver USA and its partners cut the ribbon on a $30 million rail project that will help ensure trains move, goods flow from regional businesses and Washington state remains competitive in the global market. Known as the trench, the project is a key part of the port’s $275 million West Vancouver Freight Access project (WVFA), which helps reduce regional rail congestion by up to 40%, ensuring businesses along the West Coast and between Portland, Oregon, and Chicago can effectively move products from source to market. The ribbon cutting featured port officials, US Sen. Maria Cantwell, and representatives from the offices of US Sen. Patty Murray, US Rep. Jaime Herrera Beutler and Gov. Jay Inlsee. A crowd of about 100 people from various partner agencies, port businesses and community groups also joined in the celebration. And that’s just the point of the trench, which eliminates conflicts between trains entering the port and triples the port’s rail capacity, allowing tenants to efficiently move products like grain, steel, Subaru vehicles and wind energy components. The trench was completed $8 million under budget and ahead of schedule. The entire WVFA is expected to be complete in 2017, roughly a year ahead of schedule, and about $50 million under original estimates.